Some recipes I hesitate posting because they are embarrassingly easy. Hard to even call it a recipe; rather just a quick assembling of a few ingredients. This recipe falls into that category. The inspiration came from an article sent to me by my Mom. No, not shared via Facebook (she’s not on Facebook). No, not linked via email. Old school, clip the article out of the newspaper, place it in an envelope, then bring that envelope to the post office as it requires international postage since it’s going from Milwaukee to London. That type of mailing. The article is about a foodblogger in Wisconsin who has a Five Ingredient Friday feature. As today is Friday (woohoo!!) I was wondering whether I could whip up a five ingredient dish of my own, using only what I have on-hand. After careful review of my inventory, I recalled a salad I ate with my friend Holly in San Francisco when I was visiting her a few weeks ago. We were at a pizza place (following a gorgeous walk on the coast near the Golden Gate bridge…ahhhh) and Holly raved about one of their salads, a simple tuna, white bean salad with arugula. It was a simple dish where the sum of the parts exceeds the individual components (did I word that correctly? ?…you get what I mean). I opened a can of tuna, can of white beans and tossed them with some fresh dill, drizzled with olive oil, seasoned with salt and pepper and I had my lunch in less than 5 minutes (sorry, no arugula on hand, but will add next time). It was so good I made another batch to have along with tonight’s pizza. So thanks, Mom, for the inspiration and Happy (American) Mother’s Day!! Note: This recipe can easily be doubled (or tripled) for a larger serving. If doubled, can easily make four main courses if you serve on a bed of arugula (rocket). Use whatever fresh herbs are on-hand and feel free to mix up a few different types. Place the tuna in a medium-sized bowl and break up into small chunks with a fork. Add the beans and herbs and stir to combine. Stir in the olive oil. Season to taste with salt and pepper. If you make the salad ahead of time, keep in the refrigerator. Taste before serving – sometimes a bit more olive oil and/or salt and pepper is necessary before serving. AWE! This post made my day!! 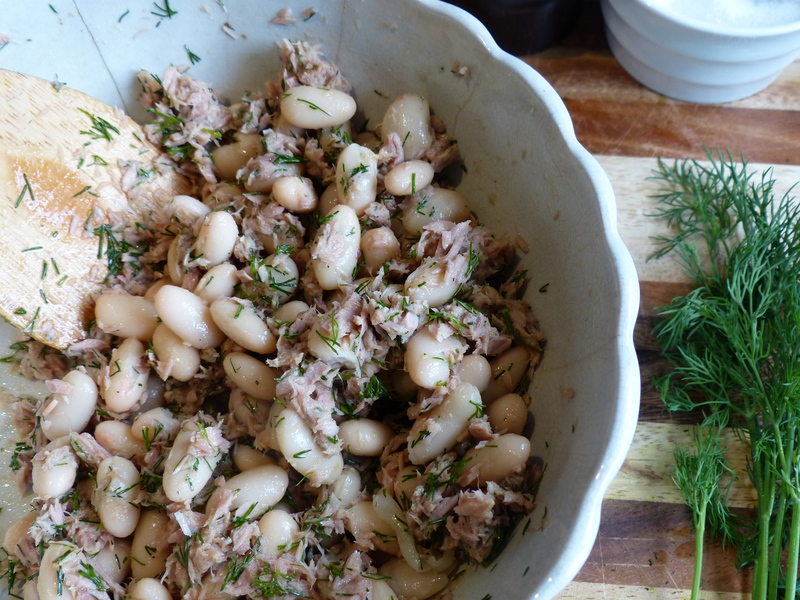 Thank you so much for linking to my site and sharing about my Five Ingredient Fridays, I truly appreciate it 🙂 Your tuna and white bean salad sounds amazing, perfect for a Five Ingredient Friday recipe!! Hi Katie, this one looked really good. I LOVE Tuna. Use to put half a can of tuna on top of a piece of pizza and heat it up in micro. Was absolutely marvelous. Loved it. Everyone thinks Iâm crazy when I mention it. Well, time for lunch. Take care.